Environmental pressure groups and human rights organizations sent a joint letter to Apple’s chief environmental officer on Tuesday asking her to eliminate toxic chemicals from the company’s supply chain. The letter is the latest in a string of efforts by such groups to get Apple to pressure its suppliers into halting the use of benzene and n-hexane, both of which are toxic and have been linked to worker illness in Chinese factories. N-hexane is used to clean screens, and prolonged exposure to it can cause nerve damage or paralysis, while benzene is a carcinogen used as a cleaning agent for electronic components. Apple isn’t the largest phone maker and is far from alone in having the chemicals used in manufacturing of its products, but is being targeted because it’s seen as the most influential among a number of brand-name electronics companies. “We’re asking Apple for strategic reasons and because we think they’ll actually do this,” said Elizabeth O’Connell, campaigns director at Green America, when asked why the focus wasn’t Samsung, which is the world’s largest smartphone maker. A string of suicides among workers in Chinese electronics factories turned the spotlight on the sometimes poor working conditions endured by workers who produce gadgets like iPhones. 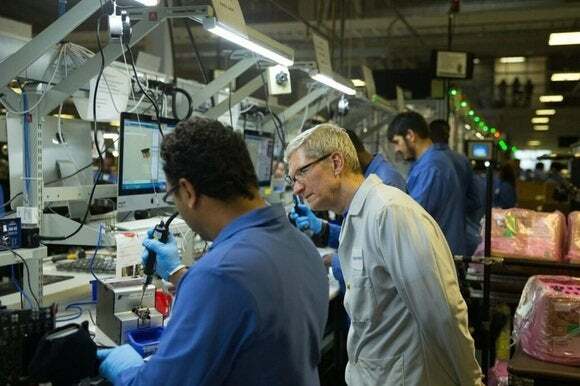 After initially appearing to downplay the problem, Apple has taken a number of proactive steps to improve conditions and conducts several hundred audits of its suppliers each year. It has pressured its suppliers to improve working conditions, imposed a number of new conditions on them and begun publishing regular reports on how they are doing. But the reports aren’t detailed enough for some. The letter to Lisa Jackson, Apple’s vice president of environmental affairs, asks her to ensure that Apple is tracking worker exposure to benzene and n-hexane, to publish the data and to eventually halt the use of the chemicals. It also asks that Apple ensure that workers who have fallen ill from the chemicals are compensated for medical treatment. The letter is the second step in a campaign that was launched earlier this year by Green America. In March, the group sent a letter to Apple CEO Tim Cook asking him to ensure that the two chemicals are banished from the supply chain.